When the Alfa Romeo brand returns to the U.S. somewhere around 2013, it'll be a version of the Giulietta hatch leading the way. Naturally, before they get here, they'll have to stand up to Michigan highways. 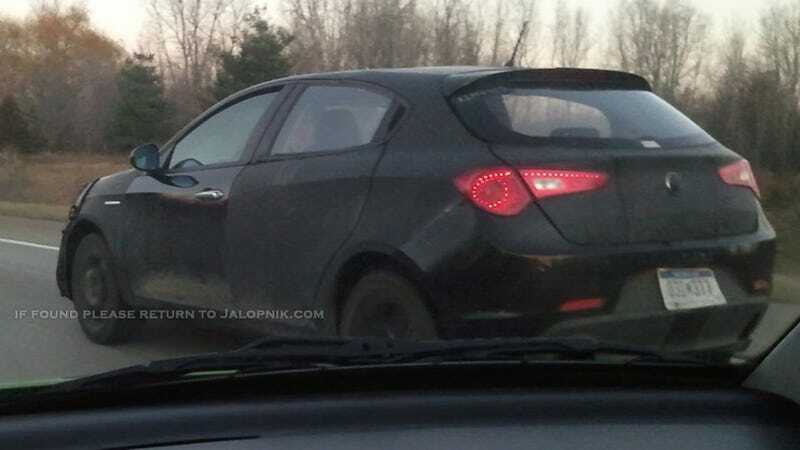 The photos were taken by Jason, who spotted the test cars near exit 94 on I-69 West near Okemos, Michigan. They were wearing manufacturer plates, had standard headlamps (not HIDs) and, as he explained in his e-mail to us, "a vertical line of LEDs inside the headlights along the inner borders (next to the grill/body panels)." According to reports, the Giulietta's platform will be a launch pad for a number of Chrysler and Dodge vehicles as well as the next generation of Jeep's soft-roading SUVs — for which Chrysler recently announced will be spending $1.7 billion to build at its plant in Toledo, Ohio. While these cars are five-door models, it's unclear whether the first U.S. versions will be three- or five-door cars. And yes, technically the Alfa Romeo 8C Competizone was the first new Alfa here since the '90s, but unless you'rea Glickenhaus you didn't have a chance to buy one. [gallery 5862608]This is just another reminder the Italians are getting closer to an all-out return to the plebe-car world. And this time they're bringing better equipment than last time. From all accounts, it looks like the Giulietta will be a more fashionable Subaru Impreza at first — until Abarth gets its mitts on it.